Its Garden Party time again, where a magazine clipping drawn out of the inspiration shoe box becomes the basis for a card. Here was the inspiration piece I posted last Tuesday. I'm excited to say - Philippa played along! You can see her beautiful card here! Edited to add: Michelle played along too! Check out her wonderful card here. And here is my attempt. I found the striped paper in my stash in the "green" section. I don't know when or where I got it, but it proves to me that a large paper stash is really a necessity - not an indulgence. I chose to do pink hydrangeas and I stamped the same hydrangea multiple times with Versamagic Tea Leaves ink to create the patterned paper in the lower block. 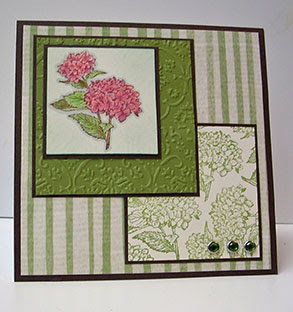 This stamp is part of a great cling set from Serenity Stamps called Blissful Flowers. It is available in the Paper Garden Projects store. I colored the hydrangeas with my Copic markers. 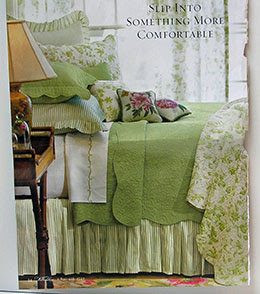 I cuttlebugged the green panel to mimic the bedspread texture. I matted everything in brown, trying to bring in the side table and add some contrast. I added crystal brads because of the glass bottles on the side table. 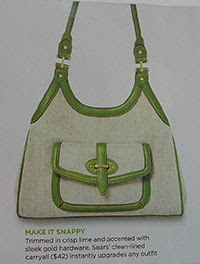 A perfectly lovely purse, one I would not mind owning. But make it into a card? I need some help here! I think I need to start going through more magazines so I can stock with "inspiration shoe box" with some better stuff! I played along! I love your card...this was fun!!! Here is the link to my card....I didn't know if I should email you before today with it or not. This is gorgeous!!! I saw Michelle's and hers is so lovely too. Absolutely WONDERFUL! I love this idea, but I don't know how you DO it - your cards are so perfect and soooo obviosuly inspired. I would never be able to create in the way you do - you're such a inspiration!! Very nice. I hope to play along soon! Whoops, I'm a bit early, I did a take on the bag picture.. This was fun! Thanks for the ideas. Forgot to mention that your card is beautiful - great take on this challenge - wow! What a great idea...how can I join?